Last month was so busy that I couldn't even find a better time to bake a cake for my elder one. I even told one of my friends that I might try a citrus flavor for the birthday cake, but it never happened. Feeling guilty, I finally decided to make some cupcakes to compensate after couple of weeks. I took these cupcakes to church and everyone loved it. I believe in pairing or matching to some extent. That being said, let it be food or anything else there should be some kind of chemistry between the things you pair, otherwise it may not result in anticipated results. The cupcakes I made were perfectly paired with the frosting and I couldn't have made it better if I had experimented with some other frosting. Yes, you read it right; it was an experiment that worked out perfect. 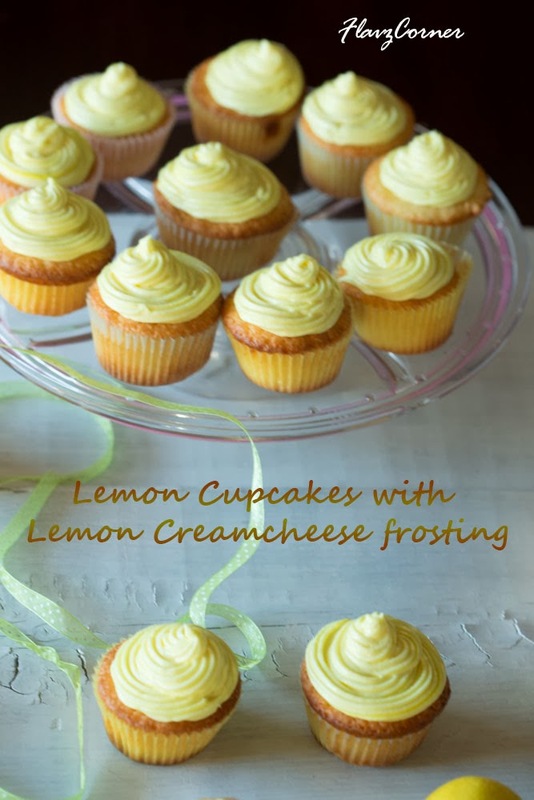 Since I am not a big fan of very sweet frosting, the lemon cream cheese frosting was just apt for my taste. Now let me share with you something that happened the same week to me that is related to pairing too :). Curious? Ok, here you go... I had mentioned in my previous posts that I go to work early. Our summer dress code at work changes beginning of October. The pain of wearing hosiery or stockings begins around this time. I try to pair socks/hosiery and keep them in the drawer to grab them easily in the morning. That day as usual I grabbed a pair, put on the hosiery (black ones) to match my black skirt and went to work. Since I do this in the early morning, I use the dim light so that I don't wake up anyone else. The sun won't rise till 7:00 am, so remember its still dark when I got to work. Got busy with work and at lunch time I decided to step outside and check out for some fall home decoration. Went to the store and bought few stuff and got back. Got out of my car, the sun was shining bright by this time. As I was walking through the parking lot, I simply looked at my legs...I was shocked. What did I pick? How did this happen? I was wearing navy blue hosiery on one and a black one on another. I turned around and saw group of people coming behind me who went out for a walk. I was literally running into our building so that no one would notice... finally pulled it out. It was such an embarrassing situation. I am not sure if anyone had noticed the hosiery mismatch while I was in the store. Kids sometimes do the opposite day and wear different color socks to school, but it was not any sort of opposite day for me, it was an imperfect pairing...:)....Have you ever experienced anything similar? Pre heat oven to 350 ° F.
Sift flour, baking powder and salt 3 times and keep it aside. Using a stand or hand mixer, whip together the eggs and sugar till fluffy. Now gently add the oil, lemon juice and lemon zest. Whisk again for 20 seconds. Gently fold in the flour mix and mix for 1 min. Bake for 20 minutes in a muffin tin lined with cupcake liners. In a cold stand mixer bowl, mix the cream cheese till it is smooth. Add the butter and whip again till soft. Now add powdered sugar 1/2 cup at a time and mix till soft peaks are attained. Add lemon juice, lemeon zest and yellow food color and whip for 30 seconds. Cover the bowl of frosting with a plastic wrap and refrigerate for atleast 15-20 minutes before piping. Pipe the frosting on the cupcakes as desired. 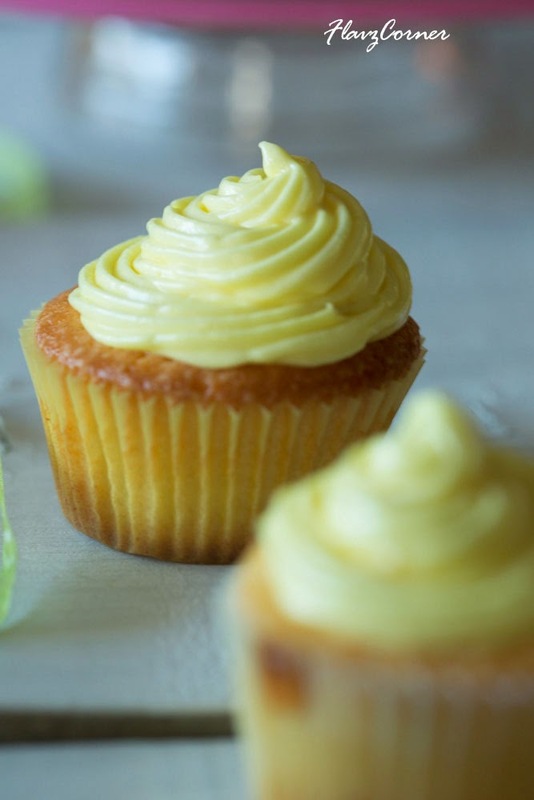 Refrigerate the cupcakes in a cake caddy or in a closed container till ready to serve. Instead of cupcakes, you can make a 8 inch round cake and decorate it with the lemon cream cheese frosting. The frosting is not too sweet, so if you like more sweeter and stiffer frosting add more powdered sugar while whipping the frosting. These cupcakes look awesome... love the pairing !!!! Thanks Shema!!! I had done lots of blunders with absent mind which is rather embassing to share lol!! Oh, I've done different socks by accident before. Usually black and blue, and yes, it was because it was rather dark when I dressed. 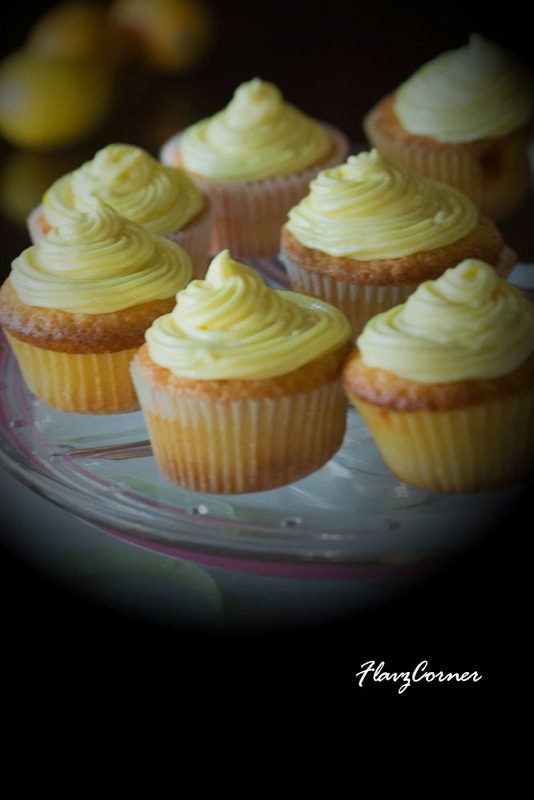 Anyway, I love lemon - these cupcakes have my number on them! Funny story Shibi...I'm lucky I haven't had to face that ever till now...but then I usually have my socks or whatever it is tucked under my pants or boots...not much of a skirt wearing gal ;-P The cupcakes look very nice and I have also used this India Tree brand, I've used only the red. Have a green and yellow left. The cupcake looks soft and yummy. Especially love the frosting! What luscious cupcakes...I could not be nearby them because they would disappear in seconds! I guess I am not alone :)...Thanks Anupa for the comment!! These just came out of the oven. They are so light and fluffy. Like eating a fluffy cloud! I can't wait to get the frosting on them. Thank you! Thanks for trying the cupcakes and letting me know the outcome!!!! Can I substitute the real lemon juice for the store bought lemons juice ? Not sure what the measurements would be. Thanks Alliyah for visiting my blog!!! 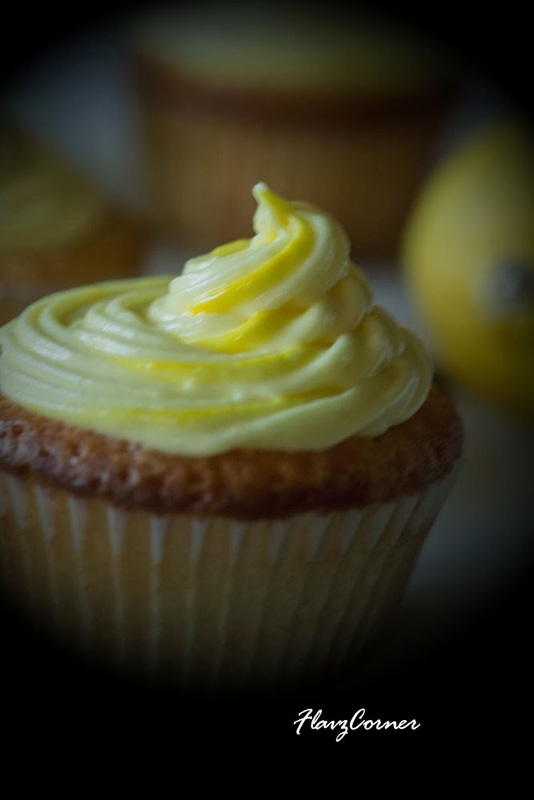 I would recommend fresh lemon juice and lemon zest to get the natural flavor, but if you don't have lemon juice, start with 1 tsp of store bought lemon juice, as it has more concentrated taste than the fresh ones, add 1/4 tsp each time till you reach your desired taste. Hope this helps.